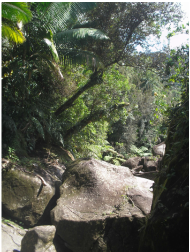 Book now for your private (non mass-tourism) tour of "El Yunque"
El Yunque is the only tropical rain forest in the US forest system. On 2011 it was awarded as one of the "New 28 Wonders of Nature". It is located in Rio Grande, Puerto Rico... about an hour away from San Juan. 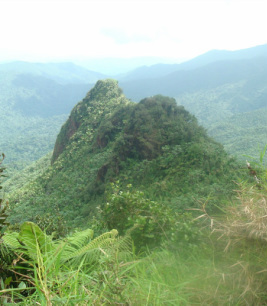 It's natural biodiversity makes El Yunque a "must-see". In a small geographic area you can witness several ecological zones and features. From the top of the mountains, you can experience exceptional views and the mysticism of the dwarf forest**. **We are the only tour company that walk with the guests to the mountain peaks. 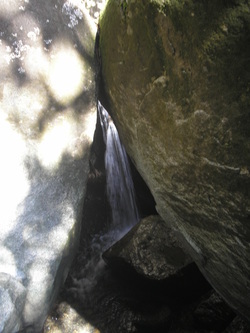 El Yunque receive 1.3 million tourists every year. 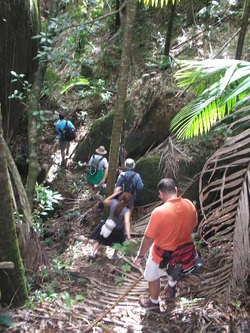 There are many tour companies in the market who have been taking people to our beautiful rain forest. However, most of them focus on commercial mass-tourism. They come in big buses, tell you some facts through the microphone, stop for pictures, and maybe let you out for a short walk. Most of the commertial guides don't even walk with their guests! While there is nothing wrong with mass-tourism, the guests are missing out the experience of really connecting with the rain forest. El Yunque is a lot more than a place to take pictures... it is a magical place. The guides who work with Rubio are passionate about the Rain Forest, and will get you infected with the bliss, the relaxation and the excitement that can be achieved when you feel like part of the whole. Some of them are graduates of the Barbara Brennan School of Healing, and some have lived for many years in the Amazon, the Biosphere II, Tropic Ventures, among other wonderful places.